Imagine three married couples went out to eat and split the check the following way: The husbands split half the bill in proportion to the assessment on their respective houses. The wives split half the bill in proportion to the number of school children they have. Then the state gives each couple a different amount of help depending on how poor they are and how many kids they have. Whatever's left is what each couple has to pay. It's a crazy way to split the check. But if you substitute "town" for "couple" and "equalized valuation for the town" for "assessment on a house" and "number of students enrolled from the town" for "number of children" that's how we pay for schools. That's apportionment in the Oyster River Cooperative School District. The basic agreement that makes the cooperative work is this apportionment formula to divide up the bill. It's half by town valuation, half by number of students per town, with the state aid then subtracted by town. Apportionment is a touchy topic, guaranteed to tick everyone off. Everybody thinks their town is getting shafted by the apportionment agreement. I'm not going to get into whether it's fair to split the bill this way. The coop's going to be around for a while and the apportionment formula is unlikely to change so it's occasionally worth learning about. My plan for keeping emotions calm is to make this pretty dry. Warning: partial derivatives ahead. The reason to bring this up now is that Business Administrator Caswell calculated that Madbury's local school tax millage will increase 6% if the current budget goes forward (3% operating increase). The school board is all in a tizzy now about poor Madbury. I'm going to descend into math soon, but before I do let me summarize the main conclusion. The upshot of it is that at least part of Madbury's big increase is that they had some sort of audit and lowered their total valuation. Considered in isolation, this will have the effect of lowering Madbury's local school tax, as half the bill is allocated in proportion to their valuation. Nonetheless Madbury's millage will increase, since their decreasing amount of taxes is divided by an even faster decreasing total valuation. But even though their millage is going up, their taxes are going down and the taxes of Lee and Durham have to go up to compensate. So don't feel sorry for Madbury. But don't feel that smug either -- I believe since 2010 Lee and Durham have both lowered their assessments as well, though I thought I saw Lee had gone back up again. Madbury's perhaps just a bit late to the party. OK, the nice stories about dining out are over and we're going to look at the formulas. You might want to skip to the Results section at the end. There's going to be a fair amount of definition and math, but it pays off in the end. I'm going to try to minimize notation, so it's going to be a bit terse. You may have to refer back to the definitions to know what the variables are. In general I'll use small letters for variables for individual towns (so there are three instances of each small variable, one for each town) and caps for variables that refer to the district as a whole. I think s is calculated from the October 1 attendance numbers, so you can help your town's taxpayers out by keeping your kids home that day. That's probably a bad idea. I think previously I recommended you send your sick kid to school that day as state aid is partly determined by the number of students that do show up. B is the gross amount to apportion among the towns. The local school property tax collected from owners and the state aid to towns all add up to B. B is essentially the tax impact in the budget goal. w is the state aid to the town in dollars (w for town). That says that each town's share of the total bill is the average of its share of the students and its share of the property value. The bill is divided before each town's state aid w is subtracted, and the net is the tax t to be divided among town property owners. You can view s as the capitalist component - each town splits half in proportion to its student share, a lot like paying tuition for those students. The socialist component is a - the towns splits that half in proportion to its real estate valuation. Of course within a town the bill in split among property owners in proportion to real estate values, so even s is socialist. You could imagine the coop funded by a district-wide property tax, with the district as a fully united entity with the budget funded by a property tax proportional to assessed value irregardless of town. The other option has the district billing the towns in proportion to the students from each town, like tuition. Our district is a fifty-fifty compromise among these two. Then the state gets to put its hand on the scales. There may be a detail about equalizing the valuations across towns that I'm leaving out here. Other things I'm not sure about include how the state aid is calculated and why the state tax rate differs between towns. After apportionment, you can look at the pie two ways, with and without the state. f_Lee + f_Durham + f_Madbury won't add up to one because the state aid has been subtracted out. If you set f_state = sum(w)/B, then the four of them would add up to one. It's a pretty good approximation to think of f as a nine slice pizza pie, with Madbury getting one slice, Lee and the state two slices each, and four for Durham. Without the state it's a seven slice pie, Madbury, Lee, Durham forming the geometric sequence 1, 2, 4. What we're interested in here is how the outputs tax and millage change with each of the inputs. Let's focus on the percentage change in the output for each percentage change in the input. The share of students s is already a percentage, so for that one we have a percentage of a percentage. A 1% change means the number of students in a town goes up 1%. Technically, they're not new students moving into the district but just changes within the district, but that's a detail that doesn't matter much. At this point most sane people would make a spreadsheet and play with the inputs to see how the outputs change. That's what I did. Scroll to the end to see the spreadsheet. But I also did the somewhat less sane step of treating the whole thing as a physics problem. What we want to know is how each output changes when you change one input a little bit and hold all the other ones constant. Let's determine the factors such as %t/%B, which when multiplied by a given percentage change in B tells you the percentage change in t.
Let Δx be a small raw change in x. Then the percentage change %x = Δx/x. For small Δx we can approximate the change in the dependent Δy = (∂y/∂x) Δx. For ease in typing, from now on I'll write the partial derivative using d as in dy/dx. I'll also use a space after a fraction to indicate multiplication by the fraction; without the space it's multiplying the denominator. I'll also indicate x squared as x^2. %y/%x = (Δy/y)/(Δx/x) = x/y Δy/Δx ≈ x/y dy/dx. Let's start with how the percentage tax increases with each percent increase in the budget B, %t/%B. This says a one percent change in the budget leads to a p/f percent change in the town tax. f is smaller than p because of the state aid, so p/f works out to 1.2 for Durham and 1.4 for Lee and Madbury. I suppose I should pause here and emphasize that these are significantly larger than one. The more (relative) state aid the town gets, the bigger the magnification. It's not so bad because it's offset by the state aid. It's exactly offset (meaning the effective factor is one) by increases in w as far as they go, but only that far. Once the budget percentage increases beyond the that of state aid, the taxpayers feel the brunt of the full p/f ratio, and that hits harder in the towns with proportionally more aid (Lee and Madbury). The last part comes from t=mv=fB. There's no difference between the sensitivity factors (sometimes called "loads") on total tax and millage for all of the input except v. This is because when the valuations stay constant, all the changes in the tax paid are reflected in the millage. 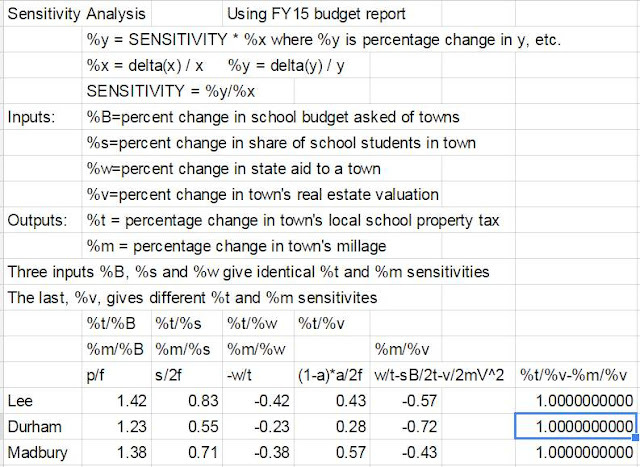 Since changing v changes the tax base, the millage and tax factors change differently when changing v.
As the issue at hand is Madbury lowering its valuation, let's do %t/%v and %m/%v (the hard case). Big V is the sum of the v we're interested in and the other two town's v's. Let k = V-v the sum of the total valuation of the other two towns, treated as constant in this partial derivative. The load a(1-a)/2f gives the percentage tax increase for each percent change in v. It ranges from .3 in Durham to almost .6 in Madbury. It's positive, which means by lowering v a town reduces its taxes t.
It's an odd-looking factor. a(1-a) is the fraction of the valuation from the given town times the fraction of the valuation of the other two towns combined. It's maximized when a=1/2, which Durham comes pretty close to. But the f in the denominator is the fraction of the budget the town pays, which is also maximum for Durham. The f wins out, so Durham's factor is smaller than Lee's and Madbury's. Now let's look at the most difficult case, how the millage changes with valuation. Here we're looking at a percentage change in a millage which is already a kind of percentage, but that seems to be how people look at it. It usually makes sense as the millage is proportional to your property tax when the assessments stay constant. Each one percent change in a town's valuation changes the millage by the complicated factor above. Let's meditate on the terms a bit. The first term w/t is the relative contribution of the state compared to the local taxpayers for a town's portion of the local school tax. It's around .4 for Madbury and Lee and .2 for Durham. The more the state kicks in, relatively speaking, the more a town benefits by lowering its valuation. The next term, -sB/2t is the ratio of sB/2, the amount the town pays because of its student share, and t, the town tax after state aid. You'd expect the student share to be more than half of t but less than all of t, and indeed this part comes in at -.5 for Durham, -.7 for Madbury and -.8 for Lee. The negative sign means that the more students the more the millage decreases when assessments go up. The last term -vB/2mV^2 is pretty wacky. v/V is a so we have aB/2mV. aB/2 is the money the town owes due to its share of property value. That's oddly compared to mV, which is the given town's millage applied to all the property in the district, so is approximately sum(mv)=sum(t)=B-sum(w), the total local property tax collected in the district (the budget less the state aid). That's adjusted up or down depending on whether the given town's millage is above or below average. The term comes in with a negative sign, coming in at -.2 for Lee, -.4 for Durham and -.1 for Madbury. Actually what I should have done is what I did below, eliminate m by substituting t/v. which is perhaps slightly more sensible. Adding it all up, we get the factor of percentage change in millage for each percent change in town valuation as -.6 for Lee, -.7 for Durham and -.4 for Madbury. The negative sign means for 10 percent off their valuation, Madbury increases its millage by 4% even while (as we learned above) decreasing its local school property tax by 6%. I noticed doing the table that the difference of the two loads, %t/%v - %m/%v, is always one. (Since one will always be negative if the other is positive, this means the absolute value of the factors sum to one.) This means that the difference of the percentage changes in tax and millage will be the percentage change in valuation. For example, a 10% decrease in Madbury's valuation leads to a 6% reduction in tax and a 4% increase in millage. It works out nicely when t is in all the denominators, so let's change v/m = v^2/mv = v^2/t. Finishing up the other inputs, let's next do %t/%s, how taxes (and millage) change with student share. As s is already a percentage, %s is a percentage change in percentage. This is confusing but you can think of %s=.01 as meaning the town (approximately) increases its student enrollment by 1%. In Madbury this means its share of students s would change from 15.51% to 15.67%. %s is probably mostly from the difference in towns between incoming K and first graders and outgoing twelfth graders, with shocks and perhaps trends according to whichever town is deemed more desirable to families with school children moving in. This says for a one percent change in the town's enrollment you increase local tax by sB/2t = s/2f percent. That term already appeared above with a negative sign in %m(%v). It's the town's share of the enrollment tab, and that gets compared to t, the local tax from the town. It's also s/2, the percentage of the budget the town pays for students, divided by f, the fraction of the budget the town pays in local property tax. The load works out to .8 Lee, .6 Durham, .7 Madbury. Here's a spreadsheet with the actual FY15 numbers. We're in FY16 now and talking about FY17 budget now for elections in February and March. I haven't used those numbers since I couldn't find them. Maybe after Thanksgiving. Here's the sensitivity table shows how for each one percent change in an input parameter (if all else stays constant) what percent change to expect in the output parameter. The first three parameters when altered one percent change both the local tax and millage by the same factor as given in the table. 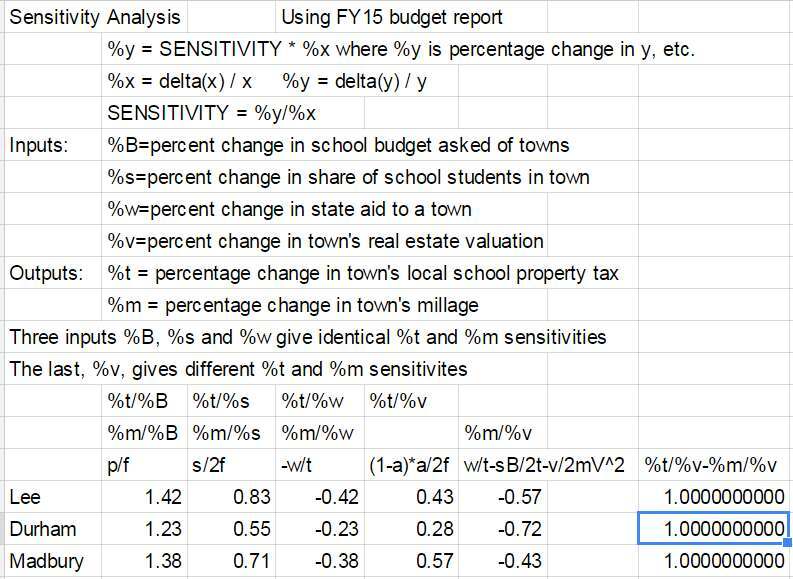 The fourth parameter, percent change in town valuation (%v) has a different effect and opposite effect on the local tax and the millage. In particular a 10% decrease in Madbury's valuation, all else being equal, lowers Madbury's local school tax 5.7% but raises its millage 4.3%. Again, the conclusion is a 10% decrease in Madbury's assessment leads to a 5.7% decrease in taxes and a 4.3% increase in millage there. Let's look at all the percentages first, starting with a and s. Lee has 27% of the real estate in the district but 37% of the students. Durham has the opposite tilt, and in Madbury it works out to about the same. It's one reason the millage is higher in Lee -- less real estate to support more students. The average of s and a make p, the proportion of the gross budget B that each town owes. But each town gets a different amount of state aid, so in the end the actual fraction of the local property tax t/sum(t) works out much closer to the valuation proportion a. This makes sense -- the purpose of the state aid is a progressive shift of the tax burden toward the richer towns. Madbury gets a little more help because it has a lower state education tax, not shown in this post because I'm focusing on the local school property tax. When you account for the state aid, the budget is divided into a nine slice pizza pie, f. Madbury buys 1 slice, Lee and the state 2 each, and Durham 4. The district reports p and a in the annual report so I computed s by working the average backwards rather than by researching the number of students from each town. Now let's look at v/s, normalized so Lee is 1. This is the town value per student, a measure of how rich the town is, i.e. how much real estate there is to support each student. By this metric Lee is the poorest, which is really just to repeat what was said before -- they have 27% percent of the real estate supporting 37% of the students. By this measure Madbury is 33% richer than Lee and Durham is 74% richer than Lee. What's missing from this analysis is an understanding of how the valuations, student fraction and state aid varies over time. That's more research than I can comfortably do on vacation, so stay tuned. How does tuition students change these factors? In theory tuition students should reduce taxes but the district gobbles the money and then still spends even more. If the district gets money from Barrington does the state use that against us in any way? The tuition revenue reduces B, so when I say B is going up 3%, that's after the additional tuition has been subtracted. All else equal, without the increase in tuition revenue the change in B would be even higher. The tuition students themselves are left out of the calculation of s, the share of students by town. But you forget that the tuition proposals listed tax relief as part of the deal. So by spending the full amount rather than applying it for tax reduction is a farce. It's spending above the inflation rate.